White Christmas – Just a Bleak Memory? With temperatures warm like in summer I have a hard time to get into the right mood for Christmas. As much as I enjoy the sun generally, my traditional clock works differently: Christmas needs to happen in real winter and winter needs to look white and feel cold. Despite the warm temperatures in Southern California, there is after all some snow to find, even if it is man made… It just means a two to three hour drive to places such as Big Bear, Mountain High, Mt. Baldy or Snow Valley Ski Resort, which is supposedly famous for getting more natural snow than any other Southern California resort. The snowboarding and skiing season has definitely started! But even locations like Lake Arrowhead or Idyllwild have sported snow already this season and presented themselves already all in white. 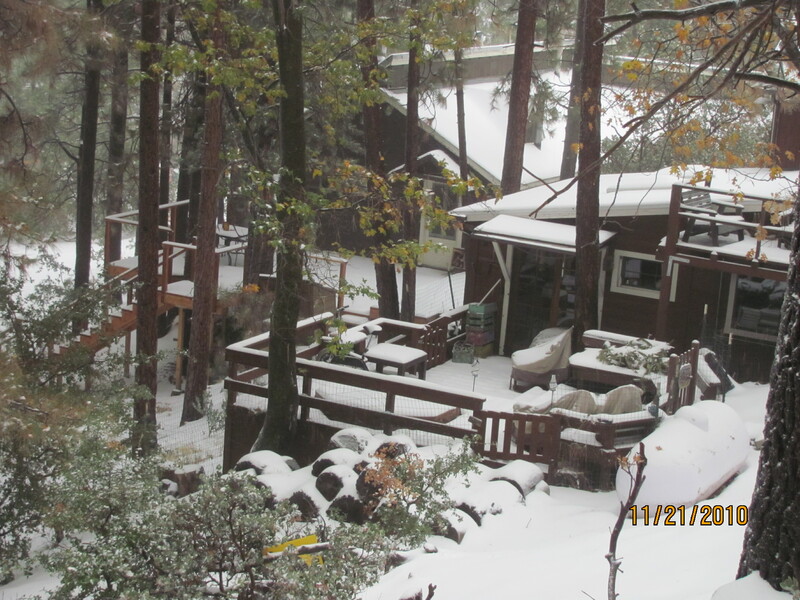 In fact we went to Idyllwild in November and had our first completely unprepared snow experience! Having left the beach cities at moderate temperatures , the weather changed within one day completely once at Idyllwild, and it began snowing through the night, without stopping until the next day. In disbelief we realized that we actually got snowed in! Who said there can’t be a White Christmas in Southern California…? I guess I have to thoroughly revise my comment and plan to spend Christmas in the mountains. I am determined: this year we’ll relive my memories of a white Christmas! Nicht in Massachusetts wo ich wohne. Es ist gerade jetzt fast 15 grad Fahrenheit. Ich kann nicht warten zum Schilaufen zu gehen! Ich beneide Sie 🙂 Zum Trost gibt’s ja auch bei uns ein paar tolle Schigebiete, nur leider nicht gleich vor der Tuer.